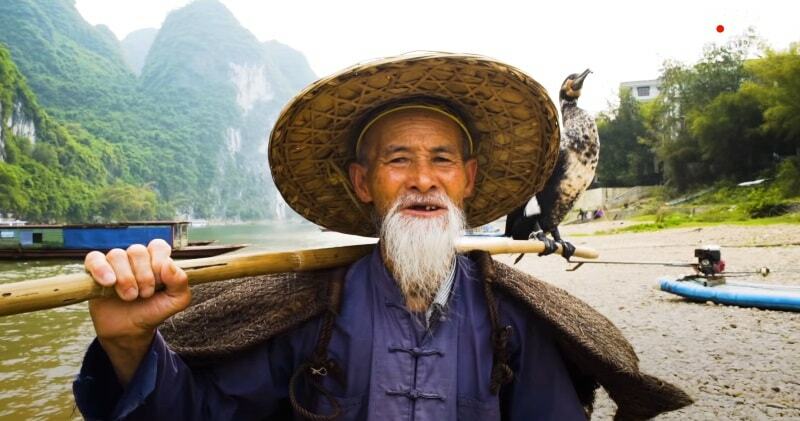 Along the scenic Lijiang River in China, brothers Huang Yuechang and Huang Mingde have been keeping up a centuries-old tradition of fishing with cormorant birds. Forgoing nets and modern fishing poles, these brothers have cultivated relationships with their birds in a way that’s found them success in cormorant fishing for more than six decades. But with no young fishermen choosing this ancient method, they may be the last ones to carry on this rare Chinese tradition.To control the birds, the fishermen tie a snare near the base of the bird’s throat. This prevents the birds from swallowing larger fish, which are held in their throat, but the birds can swallow smaller fish. When a cormorant has caught a fish in its throat, the fisherman brings the bird back to the boat and has the bird spit the fish up.